That is not only the theme of this excellent science fiction novel — it is also at the very heart of the novel’s story premise. Once again, I continue with my reviews of my favorite novels by Janet Morris and Chris Morris. But how I ever missed Outpassage when it was first published in 1988 I cannot say, because this is exactly the type of science fiction story I grew up reading in the pages of Amazing Stories and The Magazine of Fantasy and Science Fiction. So this is the first time I’ve had the pleasure to read this great science fiction adventure. Outpassage is action-packed, character-driven, and thought-provoking. The science is grounded in reality, but isn’t integral to the plot, and the tech never gets in the way of story and character: there is no garbage science or techno babble to muddle the plot. While this story has the feel of an old-fashioned, traditional science fiction novel from back in the day, it has a hip and modern sensibility to it. The characters are vivid and memorable, and the lean prose style is perfectly suited to the story. The dialogue is perfectly matched to each character — crisp and sharp, and very smart, with a fine balance of humor and gravitas. Outpassage moves along like a starship going warp factor seven, with twists and surprises nearly every step of the way. And that wrap-around cover — wow! Fully captures the tone of the novel, and is a loving homage to classic SF covers. Once again, “fantasy’s power couple,” as one reviewer recently dubbed them, delivers a fine and rousing tale filled with mystery, espionage, religion, politics, and corporate shenanigans. It begins on an outer space mining colony called X-31A, where a special forces Ranger Dennis “Det” Cox and his team are called in to “eradicate” a problem and clean up a mess. But the mission turns into a disaster, and Cox isn’t quite sure whether or not he saw signs of an alien presence on the piece of intergalactic real estate. Once he’s back home on earth and debriefed, Cox meets up with a woman named Paige Barnett, whom he was matched with on an internet dating site called Dream Date. Paige, however, is the Girl Friday to the top dog of a corporation called IST, who has their hands in terraforming, mining, and a few illegal activities, as well. Well, as blind dates often go, this one goes horribly wrong: both Cox and Paige are shanghaied and are then separated. She is thrown into a labor group on another mining colony called X-66B, where she falls in with a group of rebel workers. Cox, however, has been nabbed for a paramilitary mission to find real evidence of an alien presence, and to target the rebel base of union-organizing workers — on the very same X-66B. I’m just saying that those black operators who briefed us up there and gave us every little thing we asked for… they want any alien life or evidence of alien life eradicated. You think bringing this piece of stone over here fits that description? And then that rock sample is somehow mysteriously pulverized, quite by accident, or so Cox is later told. Meanwhile, Paige gets herself more deeply involved with the revolutionaries, and takes part in a ritual that so totally blows her mind, she starts to question everything she knows about IST, the CEO she is secretly in love with, and IST’s mission statement: about life, death, and her own place in the universe. Integral to all this is a black co-worker, a powerful presence of a man named Freedom Ayoub — “the man who had been dead.” He becomes Paige’s self-appointed protector and guru, and it’s mostly from him that she learns about Redemption, Resurrection, and the Holy Way. This philosophy, this cult is at the heart of what happened on the X-31A mining colony, and the ghostly alien hand Cox first sees there and then again on X-66B. This new religion is also the very heart of the workers’ revolution: what it is, what it means to Cox, Paige, Freedom, Mankind, and the very nature of existence is also the foundation upon which this wonderful science fiction novel is built. To say more on this new religion and the ultimate truth it contains would be to give away too many spoilers. When Cox receives a transcript from one of his men — a message calling for help from a woman claiming to be Paige Barnett, he sets out to search for her. The fact that they were shanghaied together while on their dream date, the fact that she is the right-hand of the CEO of IST, and now her presence on X-66B convinces Cox that he isn’t crazy, that the presence of alien life is very real, but whether or not this presence is tied in with the labor movement and the growing religion of Redemption, Resurrection and the Holy Way remains to be seen. Cox needs Paige for validation, and goes to great lengths to find her. A female pilot named Frickey follows orders that get most of Cox’s Alpha and Beta teams killed — including Schultz, who was more than a teammate to her — and then sets out to make amends. She rejoins Cox and together they go search for Paige, while working to uncover the truth behind what is going on. The last act of this intriguing story finds Cox left with the decision to obey a direct order to destroy X-66B, killing all those left behind, or to fake the destruction of X-66B, which would consign those same people to a long, slow and agonizing death. Will he find and rescue Paige? How and where does Freedom Ayoub play into all this? Can X-66B and all those left behind be saved? And what will Cox’s final decision be? You’ll have to read Outpassage and find out for yourself. Many questions are answered, and then even more questions arise that need answers. This is thought-provoking science fiction, with the action and feel of a space opera, and with elements of mystery and espionage to keep us turning the page. And the characters ring true, jumping right off the page…. Paige Barnett is a thoroughly modern woman — a brilliant, tough, no-nonsense bureaucrat who rules in her corporate world, but find herself way out of her element when she’s shanghaied and taken to X-66B. Could this possibly have been a set-up to get her out of the way because she knows too much and has spoken out against IST’s corporate policy on what first happened on X-31A? What she sees, what she learns, and what happens to her brings her to a place of enlightenment she at first fears, and then accepts. What about Freedom Ayoub, the quiet, powerful and yet almost childlike “man who had been dead”? What’s his story? Why is he so integral to Paige, and why is she determined to see that he lives and is returned to Earth to tell all that he knows and all that he is? And then there’s Frickey, ace-pilot and rock-steady warrior who undergoes her own transformation during the course of this novel. Will she overcome her guilt and grief and help to bring home Cox, Paige and Ayoub? But this is truly Dennis “Det” Cox’s story. A non-com and experienced warrior cut from the cloth of the Homeric ideal of a hero. He’s plain, blunt-spoken, and takes no bull from anyone; a real ground-pounder, a soldier who hates politics, but does his job and does it well. He’s the guy you want on your side, the guy on whose side you want to be. He faces decisions and moral dilemmas, as well as the heat of combat and the intrigues of corporate policy. But what revelations he is forced to see and accept are the hardest things he’s ever done. Enlightenment is there for him to grasp, but it disturbs him with its reality-changing truth, and he is left to face more decisions in a finale I did not see coming, but is perfect, nonetheless. For Cox, that moment arrives when he witnesses, when he touches and learns the truth behind the words… You Only Live Once. Why this outstanding novel was overlooked for Nebula and Hugo awards is beyond me. When you combine a great story with flesh and blood characters, with plenty of action, and then toss into the mix the machinations of a powerful business conglomerate, paramilitary activity, corporate intrigue and espionage, politics, religion, and an undefined, possible alien presence…you have a novel that succeeds on many levels. Once again, bravo Janet and Chris Morris! 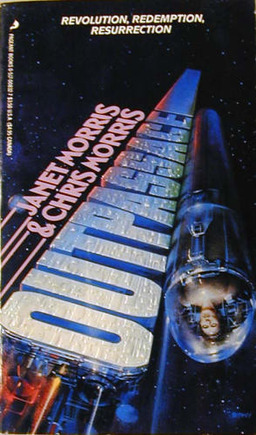 Outpassage was written by Janet Morris and Chris Morris, and originally published in paperback by Pageant Books in 1988. The Authors Cut Edition was published by Perseid Press in February 2014. It is 386 pages, priced at $24.95 in trade paperback.. Cover art, design and frontispiece by Vincent Di Fate. So said Shakespeare’s Polonius of Hamlet, in Hamlet. 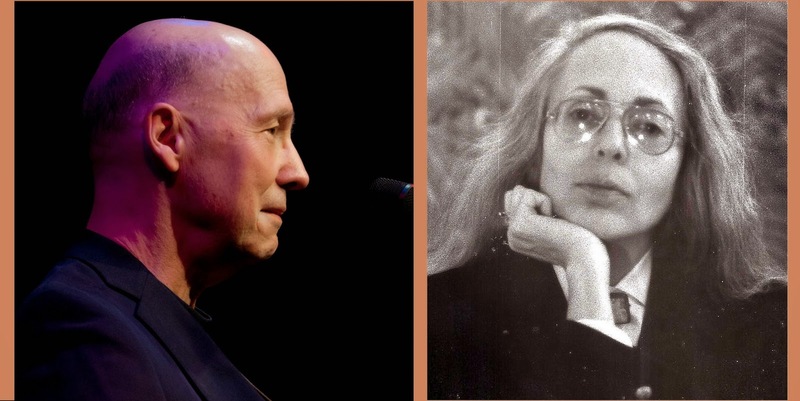 So say Janet Morris and Chris Morris, lifetime collaborators in words, music, and strategy. I cornered this elusive pair to ask some hard questions about how they do what they do, and why. Janet and Chris, writing is known to be a solitary art. How do you two manage to write seamlessly together, so much so that no one can tell which of you wrote what? Uvi, Apropos of collaboration, Shakespeare’s Touchstone said in As You Like It, “We that are true lovers run into strange capers.” As Chris and I often do. But first let us give you our view of collaboration as an art form. For centuries, two or more people have been collaborating on written works under one person’s name. History is rife with collaborations, announced and unannounced. Some examples? Shakespeare had several close collaborators, none so famous in his own right as Christopher Marlowe, who seems to us to have been his closest collaborator, due to similarity in each man’s work and style. We’ve written of these two collaborating in various tales in our Heroes in Hell series. J, the Yahwist, first writer of the Old Testament, also had many collaborators. Even before Biblical times, collaboration was common: the Greek mythic cycles were written not only by Homer, but by many writers; whether these collaborators wrote at the same time, or followed one another, is immaterial: these were true collaborations. As literature became a business, not merely an art form for the collective memory of the human race, the custom and marketing strategy of putting one — almost always male — name on a work became an unwritten convention, pushing anonymous contributors into the background. Yet they often can be found, peeking out from history’s shadows, unsung and influential. But these questions are about us, collaborating today: while we’re alive, we can answer what questions we choose, rather than leaving posterity to wonder; be as forthcoming as we wish about life and love and art. For us, life and love and art are one. We have always written together, first song melodies and lyrics, later novels — but always with one of us taking the lead, the other in support. In our early days, Janet supported Chris’ music, and Chris supported Janet’s prose. Since we met in 1966, we spent years smoothing the rough edges of our collaborative process, learning to focus on the art in question, not the artist, and thereby improving both. If we write seamlessly, it is because we deliberate about every thought, every phrase, every word, every rhythm, yet strive never to lose the shape of the initial conception. Our prose is rhythmic, our plots inventive, our song lyrics carry messages because we are keenly aware that a person has only so much time in life, and must use that time wisely. When we begin a new piece of prose or piece of music, we start with a clear idea of what that story or song must say. We vigorously weed out irrelevancies and polish our idea until it is bright, clear, shining in our hearts and in our minds. When writing prose, the mind’s eye is where the visualization first takes place; when we write music, it is the ear which first carries the message to the brain. All art is communication of ideas. We have co-written op/eds and policy pieces for governments, strategic plans for military, academic, and industrial users, as well as fiction. Writing nonfiction has taught us when and how to be sparing of words. Chris has been the voice of a TV station and products as well as our music. Now we are exploring the close relationships between music and writing fiction by producing audio books. The Sacred Band (audio edition) took a year to complete. Because the story’s characters live deep in our hearts and first drew breath in the 20th century, we took great pains to ensure that the narration remains true to the characters, who have evolved over decades and millions of words. Narration is only one breath away from literary exposition. For instance, Chris began Babe in Hell (a story in Rogues in Hell) with the idea of a baby and Solomon reprising the famous Biblical story, albeit in Hell. To Hell Bent in Dreamers in Hell Chris immediately added the quip “And twice on Sadderdays.” Once we’d named the play which is the centerpiece of the story, Janet added the flayed skins of heroes to be used as props. But sometimes, in longer works, we can’t recall who authored what lines. In “Words” in Poets in Hell, working on the first paragraph, Janet asked Chris to supply the crucial word: “Words are the what? of the mind” Janet asked. Chris said “mortar.” So the line now reads “Words are the mortar of the mind.” And so it goes, a natural give and take, sometimes contentious, often strenuous, always fascinating. Our process is not quick. We’ve taken years to do a book such as I, the Sun; we say The Sacred Band (TSB) took eighteen months, but if one includes the research and discussion time before the first word was written, TSB culminates years of effort to crystallize that story so we could then write it. In this way, we please ourselves, and have pleased many readers and listeners as well. You who know our body of work are now wondering why one name appears on so many of the books or musical compositions. For now, suffice it to say that publishers think readers want a work crafted by an individual, preferably a male (unless the work is a romance or a book about women in society). Now that you have told us how you write together, answer this harder question: Why? Why write together? A collaborator provides perspective, a broader view; a universality that one mind, male or female, often cannot attain. For centuries such collaborations were known only behind the scenes: the woman or man who was the editor, co-creator of ideas, first reader, was the power behind the throne, unnamed, a secret presence. So how do we decide whose name goes on a work when only one name appears? If one writer drives the work individually, or if a work is best read as the product of male or female, we so credit it. For this reason, we have several times used male pseudonyms when selling a book to a publisher for a particular market. As you point out, the two of you haven’t always published with joint bylines. How did your first official collaborations come about? If Janet hadn’t been a canonical contributor to the series at that time, we wouldn’t have gotten permission for the dual byline. And sure enough, other spouses and collaborators long relegated to the background began appearing in Thieves’ World volumes and other places. Subsequently, we signed a multi-book contract with Jim Baen, one of the caveats being dual authorship for some titles, but not all. We delivered those books, including The 40-Minute War, M.E.D.U.S.A, City at the Edge of Time, Tempus Unbound, and Storm Seed with dual authorship and Jim published them that way. This in turn led to other joint book contracts, including but not limited to Outpassage (1988), Threshold (1990), Trust Territory (1992), The Stalk (1994), as well as several books by single-author male pseudonyms. Nevertheless, publishers generally still wanted single male names on adventure or nonfiction or ‘serious books’ and female names on romance books, so the market continued to conform to its preference for single-writer bylines. A book with the name ‘Janet Morris’ was still worth more to a publisher than a book with ‘Janet Morris and Chris Morris’ as listed co-authors. So we created male pseudonyms and these books commanded substantial advances in markets formerly closed to us. In the minds of publishers then, and perhaps readers, a story told by a single male was preferable, but even a tale told by a woman was preferable to a tale told by one woman and one man. We set our sites on this ox, and set off to gore it. And might have succeeded, as male/female co-authorship became more commonplace, but our brainchild “nonlethal weapons” intervened, taking us out of the fiction marketplace for nearly two decades. In that interval, Alvin Toffler, author of Future Shock, another writer at the literary agency which handles us, wrote War and Anti-war with his wife Heidi Toffler, insisting her name appear this time as co-author. The revolution had begun in earnest among writers with enough clout to enforce their wishes. Do you believe that putting a man’s name or a woman’s name on a book effects who will read that book? We experimented, as did other writers and publishers, with putting different names on books. Sometimes Janet wrote with other male or female writers, to see if the ‘Janet Morris’ brand could be transferred as publishers looked for ways to turn writers into franchises, as was done with Robert Ludlum, Stephen King, Tom Clancy, etc. But when a better writer is paired with a lesser writer, quality may suffer, and even honest writers trying to accommodate one another may lose the consistency of purpose, passion, and voice that a single writer or a self-chosen pair of writers can achieve. The ‘brand name writer’ bias may then kick in, causing readers to buy only books written by the individuals or pairs of writers they already enjoy, not the franchised producers of subsidiary works or ‘as told to’ books. As for the ‘gender’ bias in literature, at present this is still a real and strong force. Men looking for adventure fantasy or science fiction or military books are less likely to buy a book written by a woman; women with a strong allegiance to women’s rights and women’s issues are less likely to buy a book by a man or co-written by a man. So the issue of whether a man’s name or a woman’s name goes on a book may be inextricably linked to subject as well as story, insight, and prose quality. You’ve both written under single-author pseudonyms, always choosing a single male. Why did you do that? Do you still do it? If, so, why or why not? We did this to break out of the science fiction/fantasy ghetto, into the mainstream, in days when those genres had a more limited market than today. Do we still do it? No. In actuality, our body of work allows us to write what we wish under either or both our names. For instance, we’re writing a novel about Rhesos of Thrace — as is our wont, this book has a Homeric feel, a purport that takes the Iliad for true, but focuses on a single character from that story and his later adventures. This book is a true novel — one part mythical realism, one part dark fantasy, one part heroic fiction in the literary sense, and one part a historical representation of the mythos of that character. We plan a new Sacred Band of Stepsons novel, which requires very specific voices and explores the hero-cult as a fait accompli, a subject fascinating us. But if we were to undertake a contemporary story dealing with modern politics (sexual, racial, governmental and corporate), we’d consider writing such a book under a new male pseudonym, to allow us complete freedom of what we’d say and how we’d say it, because the truths behind these topics are brutal and unwelcome to those who think revisionist history will solve all the problems inherent in modern society and the human condition. Which condition is, of course, the only fit subject for fiction. What are the benefits and debits of collaboration so far as process, not marketing, is concerned? If a pair entering into a collaboration sets ground rules, defines story elements and shares a joint preoccupation with the characters, two hearts, two sets of eyes and two sets of ears impart an enhanced perspective, powering the creation of characters spun from utmost reality, characters perhaps more fully realized than a single mind might contrive to make them. In a pair made up of one male and one female writer, the native intelligence of both sexes is present in great measure, bringing a universal verisimilitude. The process of reaching truth and clarity for characters and story may have uncomfortable moments for one or both writers, but facing those places in the soul where one hesitates to look is the true purpose of fiction — to portray the world through a temperament (or two, or three). What advice would you give to other collaborators about creating and marketing their joint works? If two collaborators each have a previous body of work, then once both acknowledge parity, a new book can begin taking shape. If one writer is better known or better at structure or at lyric, then play to those strengths. Do not show this book to third parties, or discuss it with others until both writers are completely certain of every nuance, every line, every twist and turn of plot and psyche. If two collaborators have no previous experience working with others, they must work harder to put aside their preconceptions and look at story and character honestly: success, not in the short term but for all time, depends upon the quality of every word. Make sure that both collaborators share the same goals. Define the story elements. Invoke the characters and be sure both agree who those characters are and what they represent concerning the story’s driving purpose. Then begin, starting at the beginning. Create an adventure that two can share, and you will have created an adventure that the world can love. Only when this first book is finished, no longer a fragile vision, but a full blown juggernaut of risk and beauty, show it to a publisher whose other publications attract you. If you both like what an editor or publisher has previously chosen, they may well decide to choose you. OUTPASSAGE – Great Science Fiction! Sgt. “Det” Cox has just spent three years under psych observation on Earth; now that he’s out-system, he isn’t about to tell anyone he’s seeing aliens again. Paige Barnett has lost everything, even her name, because she knows too much about the rebellion spreading through the Earth-Space mining colonies. Together Cox and Barnett stumble upon the mystery at the revolution’s heart and learn why the rebels are willing to die for it. Is their discovery humanity’s worst threat or greatest gift? The authorities are willing to destroy whole planets to keep the revolution’s secret from reaching Earth What’s to stop them from destroying two people? Proffering an intriguingly plausible vision of a near future, Outpassage is the new SF epic from authors Janet Morris and Chris Morris. An exceptionally well written tale that weaves powerful ideas, highly visual settings and a brilliantly conceived plot, it has all the elements of great Science Fiction, but it’s the mechanics of storytelling that really set it apart. Too many books in the genre simply seek to overwhelm with increasingly farfetched technology and outlandish characters, but Outpassage serves up palpable depth that encourages readers to reflect on the essence of our humanity. Yes, reality is altered, but when worshippers of an alien life form seemingly adopt the power to resurrect themselves, it provides for intelligent musings, reflections, and more than a little soul searching. All brought to the fore with an acerbic pen, visually powerful prose and vivid characterization. Combining oodles of adventure, masterfully paced action, plenty of intrigue, suspense and tension, there is more than enough to sate the appetites of the most ardent SF fans. A real page turner from authors Janet and Chris Morris, Outpassage is recommended without reservation! “Outpassage” is a fine example of thoughtful, adventurous science fiction. For those of you who know Janet Morris from “Thieves World” or the “Beyond” trilogy, this book will reveal an exciting new facet of one of your favorite authors. “Outpassage” isn’t written with the same lyrical, bard-like prose she uses when detailing the exploits of Tempus Thales, but such a choice wouldn’t be appropriate with a space epic. In “Outpassage” the sentences are sharp and direct, and bring life to a futuristic setting without losing any of the craftsmanship she has displayed in her previous work. Essentially she has simply updated her palate; instead of the greens and browns of Sanctuary, “Outpassage” allows her to work with the silver and black of space. The story of “Outpassage” is instantly gripping as well. A corporation is mining/settling a planet only to discover alien life on the surface. Rather than view this development as the scientific discovery of the age, the corporation becomes concerned with the bottom line and decides to “eliminate” the alien problem. We are introduced to Daniel “Det” Cox, one of the rangers who is sent to the slaughter in a battle against a force he truly knows nothing about. The alien “problem” has been developing for some time as Det is sent back to Earth for psych evaluation. On a whim, he signs up for a dating service, and gets set up with a high-ranking executive of the very corporation embarking on the plan of alien genocide. In a semi-comical twist, the two of them are shanghaied during their date, drugged, and sent to a different planet which is also displaying signs of the same alien problem. Det is commandeered because of his experience fighting the aliens, where the corporate official, Paige, is put to work in what is essentially a slave camp. I found many of the space/future touches of this work to be delightful. Det is an interesting character because he’s so adaptive. Finding that he’s been drugged and shanghaied to a foreign planet, his big concern is that he didn’t black out any briefings because he doesn’t want to look incompetent in front of the men he’s set to lead. Paige is interesting too. There is a tendency in literature to portray “corporate” folks as incompetent to adapt to a labor setting. Paige’s introduction to her new reality is rocky, but she quickly learns to climb the social ladder among the laborers to achieve the highest status available to her. She expresses moments of vulnerability which make her appealing, though she’s always got her eye on her long term goals and makes steady progress. The scenario becomes more complicated as the laborers begin to develop a complex religion that worships the alien life form, and seems to bequeath the followers with the power to resurrect themselves from death. However, you have to wonder how much of the beings that come back are the original human, and how much of them are alien. All in all, “Outpassage” has all the elements of a great science fiction novel. The space components (space travel, warfare on foreign planets, aliens, etc.) are present and expertly integrated into the plot. The writing is exemplary, and the novel moves along at a quick pace leaving you wanting more. This is a fantastic contribution by one of the best fantasy/sci-fi writers working today. This content was based upon a free review copy the Contributor received. 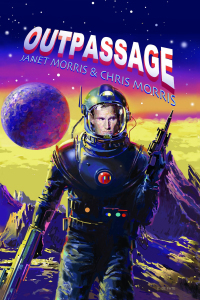 Literary Biography: Janet Morris and Chris Morris, authors of OUTPASSAGE, published in trade paper and on Kindle by The Perseid Press. An Amazon Exclusive. Authors Janet Morris and Chris Morris are the creators of numerous novels, short stories, and works of nonfiction, as well as the creators and editors of the Heroes in Hell series, whose stories include two Nebula Award finalists and a winner of the Hugo Award. Janet is the only science fiction writer invited to participate in the Rolex fiction program, Chris is an accomplished recording artist, singer-songwriter and narrator. Chris is the narrator for the forthcoming audio-book narration of The Sacred Band. The Morris’ fiction works are primarily novels which fit neatly in no single genre, including such books as I, the Sun, the rigorous biographical novel of Suppiluliumas I, King of Hatti, The Sacred Band, an Homeric novel of myth and heroism, and futuristic novels combining the heroic ethos, future technology, and metaphysics such as OUTPASSAGE. In addition to their fiction,nonfiction, AND MUSIC, Janet and Chris Morris are well known for their horses. The Morris’ have bred and shown Grand National Champion and World Champion Morgan Horses, and this deep familiarity with horses informs their nine volume heroic fantasy series, the Sacred Band of Stepsons. The Morrises’ joint fiction novels include The Sacred Band, The Fish the Fighters and the Song-girl, OUTPASSAGE, The 40-Minute War, City at the Edge of Time, Tempus Unbound, Storm Seed, MEDUSA, the Threshold Trilogy, The Little Helliad. There aren’t any aliens… are there? Sergeant “Det” Cox has just spent three years under psych observation on Earth; now that he’s out-system, he isn’t about to tell anyone he’s seeing aliens again. Ms. Paige Barnett has lost everything, even her name, because she knows too much about the rebellion spreading through the Earth-Space mining colonies. Corporal Allie Frickey is the real thing: a female hero who’s made the grade in the 203rd Army Ranger Battalion, but her training hasn’t prepared her for aliens. Redemption, resurrection, the holy way. Freedom Ayoub, a dissenter of conscience from Chad, has a chance among the rebellious space colonies to trigger a new age, but without the help of Cox, Barnett, and Frickey, he has only a prayer of succeeding. Against our heroes are arrayed the corporate might of InterSpace Tasking, America’s most muscular out-system government contractor and its minions: the unpredictable Lieutenant Locke, a US Ranger by his shoulder tab; Professor Elaine Singer, top scientist in the deep-space colonies, and powerful CEO, Raymond Godfrey. You only die once… or do you? When rebels take up arms on two classified mining colonies and the work bosses fight back, casualties start disappearing in the grip of white hands emerging from solid rock. Reports of alien life and inexplicable phenomena on two mining planets draw US Space Command interest. Amid rebel skirmishes, horror, betrayal, and death, Cox’s twenty-four rangers must find allies to face rebels who may already be dead. Together Cox and Barnett stumble upon the mystery at the revolution’s heart and learn why the rebels are willing to die for it. With Frickey and Ayoub, and the help of the shadowy Special Science Task Force, they embark on a journey home that will change humanity’s future. Is their discovery humanity’s worst threat or greatest gift? The authorities are willing to destroy whole planets to keep the revolution’s secret from reaching Earth… What’s to stop them from destroying a handful of people? THE SKY WAS thin and the color of dirty motor oil, except where it exploded above their heads. Concussion was delayed in the thin air but the smell of roasting rangers got to you right away, even through your air filters. It hadn’t been anything, not anything, that Cox had seen out of the corner of his eye. It sure as hell hadn’t been a white, delicate hand pulling Reynolds toward a wall of solid rock –– coming out of a wall of solid rock. It hadn’t. Cox’s lungs were burning despite the augmented oxygen-rich mix his recon pack was feeding him as he sprinted; he was sweating like a pig –– worse than his cooling system could handle. Overhead, he heard a subtle change in volume that wouldn’t be subtle for long: the pursuit aircraft, laying down rivers of flame as it did a one-eighty, had sighted him. It was coming back. With the bogey on his tail and nobody to answer to, Cox hit his jet-assist: a one-time-only, emergency move, but there was no way he could outrun that aircraft on foot. The wrench at his shoulders was immediate, the grab in his crotch comforting. Then he was airborne, skimming the ground toward the extraction point where Locke’s bird was already a dark speck lowering out of the filthy clouds. He could still see the charred half of Reynolds’ face, the eye like a lamb’s eye that had popped up in his soup once during a Saudi tour. He saw it so clearly that when the enemy screamed overhead, ignoring him and going after Locke in the pickup craft, it didn’t phase him any. Not even when Locke’s VTOL exploded in a gout of dirty orange flame, because he could still see Reynolds inching along the rock like he was alive, that white hand clamped on him. And then he couldn’t see anything, not for a long time, because something shorted his helmet’s system and the ground hit him, hard, in the face. What forms of marketing has appealed to you in the promoting of your book and why? Once a book such as OUTPASSAGE is due to be published or is published, we let people know when and where the book will be available, using the internet and Face Book and Twitter. We circulate review copies. We make a few carefully chosen public appearances. For example, we’ll be speaking at the Library of Congress in June of 2014: this talk on fantasy, science fiction, and the future of literature is open to the public. We do interviews. Beyond that, we trust that people who read and like the books will tell others. We make our work perennially available as e-books, since our books don’t lose appeal as time goes by. As well as writing new works, we are republishing “Author’s Cut” editions, revised, expanded, and definitive, of our works from the 20th century with Perseid Press. What makes your book OUTPASSAGE stand out from all the others of the same genre? OUTPASSAGE fits neatly in no genre: it is a novel about the human condition set in a plausible future: it is a blend of suspense, betrayal, romance, crisis, mystery, comedy, tragedy. OUTPASSAGE is one part rollicking space adventure, one part military science fiction, and one part visionary and metaphysical exploration of an all-too-possible dystopian future. Its female heroes are women empowered; its male characters are heroic, driven, and committed. 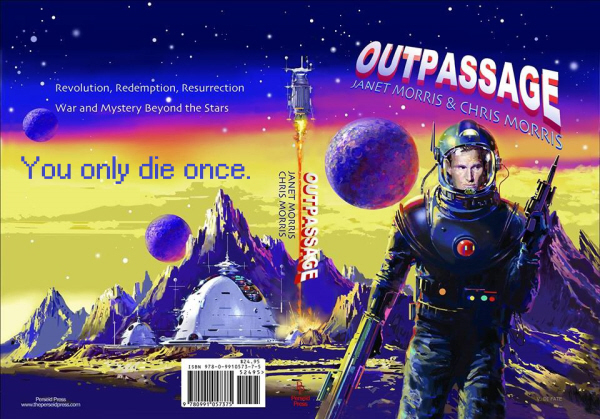 People who love classic science fiction and people who love visionary fiction will all find something to enjoy in OUTPASSAGE, where the characters embark on a futuristic odyssey, and life’s deepest questions are explored as humanity reaches a final crossroads light-years from home. OUTPASSAGE takes the reader on an exciting adventure. Unlike too many books today, it is character driven, lyrical, gritty, literary, and observant of the human condition. For OUTPASSAGE we commissioned original cover art from Vincent Di Fate, classic science fiction artist and winner of the Science Fiction Writers of America Grand Master Award. The OUTPASSAGE story is epic: it is the story of humanity’s greatest adventure. What was the best advice you were given leading you to getting published? Get the manuscript typed up professionally in double space with one-inch margins. On each of our Amazon Author Pages, you can click on any book cover to get to the book’s Amazon page. There you can instantly read or download a free sample of that book. If you could share a romantic evening with any character from literature, who would it be and what would you do? Janet says: I’d love to spend a night withOUTPASSAGE’s hero, Det Cox. If I can’t get to the future to do that, I’d love to spend the evening with Odysseus, himself a great storyteller. Chris says: Since I like older women, I’d spend my evening with Paige Barnett ofOUTPASSAGE, who has crossed a new threshold in human experience, and find out what her life is like. What comes first for you: plot or character? Character drives all in story; plot is a tool for showing character at work in the world. Heraclitus says “Character is destiny.” To write a story, find a character with a destiny and follow where that character leads. For us in the composition process, character and story come together as a unit: Someone is somewhere, doing something; has been somewhere else; is going somewhere else, seeking or fleeing or struggling to prevail against something. We can taste, touch, hear the place and character, and they’re moving. If we have a ‘live’ story, it seems to ‘move’ in our composite mind’s eye. We write a door, walk through it, and we’re there. By then we’re ready to be dragged from pillar to post by our characters. Toss a good character a bone and he’ll return you a fleshed-out drama: A good character steps up to storytelling without urging; sometimes several will vie for the viewpoint in a section, and then – only then – does plot become a driver: depending on the viewpoint character, a different temperament, ethos, and impact comes into play. Before we start composing, we know the story we’re going to tell, and who will populate it: the who, what, where, when, why of the tale to be told. This train of thought brings us to OUTPASSAGE and Det Cox, discussed below, who plunges us into a firefight in the very first scene of his book to show us who he is, and what he does. Do you have a favorite character (from your book)? Why? Det Cox owns the lion’s share of the story in OUTPASSAGE, but he’s not the novel’s sole proprietor. His interplay with Paige Barnett is sizzling. Cox is a Spaceborne US Army Ranger, while Paige Barnett is a high-powered female executive from a vast interspatial corporation: when they meet through an online dating serivce, worlds collide. Both Cox and Barnett are great fun to write, with unique sensibilities and very different views of the future they both inhabit. Cox is everything a woman like Paige Barnett dreams about: skilled, intelligent, dangerous, handsome, fit, loyal and heroic. But dreaming is different from reality, and Paige’s association with Cox shanghais her to a new frontier beyond the stars, and into peril and opportunity beyond her wildest dreams. Which three authors have inspired you most, and why? a) Homer, because he created the modern story tensions and values we all use today. b) Shakespeare, who taught us self-examination and showed us how to use words as keys to unlock the human soul. c) Suppiluliumas of Hatti, whose own annals inspired us to write I, the Sun. Character development. Tell us all about your experiences with this side of writing. All our fiction is character driven. The development of character, for us, is the most important single element: plots are few, perhaps seven, as Shakespeare said, perhaps three, as Heinlein said – character is all. Character forms the bedrock of choice and choice is story; story is choice. Our experience with writing begins with the process of summoning character, whether through discussion or meditation or both. When writers speak of their ‘Muse’ being lost or found or giving or withholding, they mean that they are, or are not, in contact with the wellspring in our minds that creates or contacts characters. Are characters created by the writer, or found? No way to know for certain. But it is impossible to get even a single individual completely represented in fiction; in a book with many characters, the writers must imply, infer, invent and subvert to bring characters forth and make that materialization in the mind seem effortless, as if the character is there, whole cloth. Protagonists…. What is your view on them? Protagonists are crucial to stories. Protagonists have sometimes been men, sometimes women, sometimes demigods, gods and goddesses, sometimes animals. In any given moment of a scene, different characters may serve the function of protagonist. A protagonist or several will be as important as an antagonist or several to a story. In OUTPASSAGE, the viewpoint switches from the male protagonist Cox to the female protagonist, Barnett. Have you ever been involved in a collaborative work? What is your opinion on working with other people and how do you go about meshing two different writing styles into a single book? OUTPASSAGE is a collaborative work, in that it is written and edited and rewritten by two people who are accustomed to working closely to create a story. This is a different process than some collaborations, wherein people take turns writing sections independently and hope the result will be cohesive. In the Janet Morris and Chris Morris collaborations, we discuss plot and character before we write, while we’re writing, and after we have written, both as they apply to daily output and to the story as a whole. This allows the work to have both a male and female element at work in the telling of story and development of character, which helps make both place and people in our stories more realistic. For fantasy or science fiction or historical or any novel that requires the materializing of place and culture as well as character, this meta-viewpoint with its ability to sketch believable female and male characters is critical to the suspension of the reader’s disbelief. As a reader, how much do consistent spelling/grammar/punctuation mistakes bother you? And as a writer, how much care do you take to get it right? We read punctuation; we hear stops; we know grammar; we apply the rules of written English; we break every rule as the story demands. We read manuscripts aloud and on screen multiple times to make sure the text “sounds” the way we wish. Punctuation is nuance. People who don’t “hear” punctuation and apply it with understanding are leaving a tool unused. We hunt for typos all the time, and errors of syntax that are unintentional. However, no one ever gets every error, which is why we use a copy-editor and proof-reader. Different books take different lengths of time. Usually a book of ours can take a year or two before it’s finished and polished. A rough draft may take six to nine months or more, depending on length. Do you invent words and language for your books? We have always invented words, compounded words, and used words differently, when and as necessary for the book to achieve its goals. These choices belong to the world and character. The Silistra Quartet (High Couch of Silistra, the Golden Sword, Wind from the Abyss, the Carnelian Throne) had a glossary of world-specific words for animals and food and customs and societies. For that series of books, to keep the earthly referents to a minimum, this was necessary. Silistra is a very challenging series, wrestling with issues of the genetic basis of behavior – of interdependence of intelligence, sexuality, and power – and needed to be set in a universe in which Earth and humanity were unknown. Later, the use of acronyms in fiction became commonplace, so we have acronyms in some books, often (but not always) defined in place, and sometimes coined terms of our own devising. The use of colloquialism – Your thoughts when writing. It’s important not to date your book unless you want it to be read later as an historical. Too much slang pins the story to a period, which is fine if it’s a period piece, but if you are writing a floating timeframe, or floating present, or floating future, colloquialisms may become discordant to the reader’s ear in a few years. When we revised OUTPASSAGE, thirty years later, we were pleasantly surprised at how few words and concepts needed to be updated. Do you find yourself jotting notes, phrases, characters names etc at times? When we’re in a car, we get many ideas, and write them down on anything: Starbucks bags, envelope flaps, receipts. What is your favorite to read? What is your favorite to write in? What is the weirdest you have ever seen? We don’t write in any one genre, although much of my work is classed with science fiction or fantasy by booksellers. We enjoy myth and fantasy and ancient historical novels (not bodice rippers); we love classic science fiction (which once was called ‘hard’ or ‘military’ sf) , which extrapolates a full-blown worldview as well as imaginary worlds while not misusing physics as we understand them; we like time travel books such as The 40-Minute War and stories with relativity effects as inescapable factors in the construct, such as we created in OUTPASSAGE. We equally enjoy modernist novels, magical realism, futuristic novels with international settings, plausible projections of future conditions. We write novels which may be set in the past or future, but always contain the full palette of human responses: pain, pleasure, mystery, drama, comedy, tragedy, triumph, betrayal, discovery. The proliferation of genres, created primarily as selling tools, is lowering the level of what is acceptable as fiction. Genres are meant to allow more bestseller lists and award categories to exist: this is not a qualitative choice; rather it’s a marketing choice. Only a novel is a novel: a novel must be about the human condition, and contain the gamut of life’s constituent elements. Even if you are writing a book in a world built so as never to have been influenced by life on Earth, its characters must be ones with whom we can identify and your story must carry these common elements forward or be, ultimately, inadequate. To write, you must read; and reading modern genre fiction is for the most part like feasting on chocolate, which provides quick thrills and calories, but no lasting nourishment. I don’t know how it is for other writers, but in the creation of characters I actually hear their accents if they have one when I write dialogue. How is it with you? We hear characters whenever we write. Often we are writing in the ancient world or a mythical antiquity or quasi-mythical antiquity, so we don’t transliterate accents, beyond perhaps choosing a certain spelling of an ancient word or name. Sometimes, with modern fiction such as OUTPASSAGE, we do use slang, profanity, regionalisms, but subtly. In OUTPASSAGE, we use different constructions, such as “I don’t know” versus “Dunno” to indicate whether Cox is stressed, or in combat, or relaxed, or speaking formally. Cox is a smart person, a subject matter expert in his field, but not literary or elegant in speech: he’s a US Army ranger, simple on the surface, but both strategic and tactical, and he moderates his own diction when he’s talking to his troops, becomes more folksy; when he speaks with superior officers, he’s more than capable of holding his own but his diction changes. We occasionally write with transliterated accents in a short story or to quickly sketch a character, but usually only if the way the character is speaking is as important as what he’s saying, because too much written dialect can become labored and distracting. What are the first 5 things you need to know when first beginning to write? Who. What. Where. When. Why. The reader deserves a writer who starts the story with a good understanding of that story: what has happened, what must happen, how the character feels about what’s happening, who the viewpoint character (or omniscient observer temperament) is, in depth. If you can’t answer those questions about your story and the point of view from which the story is told, you’re not ready to write. When a writer drops into a story with no idea what’s going to happen, it shows in the fuzziness of both exposition and event. Is writing habitual? Have you found that it has the ability to encroach upon your normal life? Writing is our normal life. Janet sold her first novel in her mid-twenties and made her living as a novelist until we could sell collaborations; then we made our living writing nonfiction, and now are making our living writing fiction once again. To write effectively, you MUST let the novel come first, before all other elements of your life: a book for which the writer has not sacrificed his ‘normal’ life is not a novel, it’s a memoir.